We all remember how Airtel stormed our TV sets and online media with its “Open Network” campaign. Now, in one of the most competitive way, Jio is planning something similar to woo its users. The Reliance-backed network is tipped to launch similar facilities so that people who are concerned about Jio 4G coverage before joining their network can check its 4G coverage in their area. In India, data connectivity is a big issue; even after six years of 3G launch most of the areas suffer from slow connectivity. Basing judgements on such matters, many are still unsure about Jio’s coverage and signal strength. 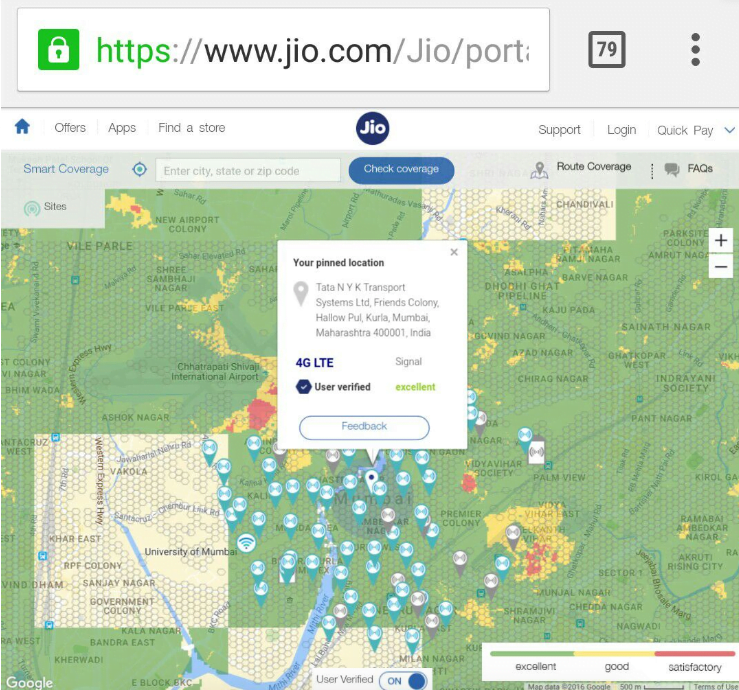 To solve the issue, Jio has made a new network map where people can quickly check or monitor Jio’s network strength and coverage by providing a ZIP code or local address. The feature is sill in its beta stage, and Jio has not yet included it on its website. However, Jio is expected to announce the new network tracking feature soon. Similar to Airtel’s Open Network, Jio’s feature also allows users to check towers and Wi-Fi availability. Through the feature, users can report issues with voice and data quality. The feature will be available on both mobile and desktop websites of Jio. The tracking feature shows the info with a verified tick mark, which is to signify is authenticity and accuracy. We think that this might act as Jio’s trump card to enhance its already growing user base in India. With location tracking for towers and signals, many users would choose the service for its presence in their area. What’s your take on this Airtel-mimicked feature that Jio is planning to launch? Do you think it is helpful enough? Also, (if you’re an Airtel user) do you use Airtel’s tower tracking service often? I am not getting this option anywhere.